A landlocked country, Afghanistan, located between energy surplus regions and energy deficit areas is blessed with abundant renewable energy sources (RESs) which can exploit not only to cover its power demand but also to earn remarkable export revenue. 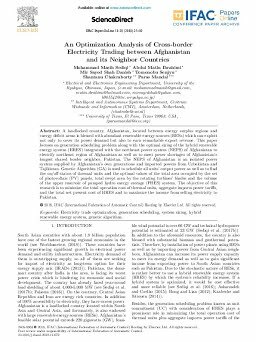 This paper focuses on generation scheduling problem along with the optimal sizing of the hybrid renewable energy system (HRES) integrated with the northeast power system (NEPS) of Afghanistan to electrify northeast region of Afghanistan as well as to meet power shortages of Afghanistan's longest shared border neighbor, Pakistan. The NEPS of Afghanistan is an isolated power system supplied by Afghanistan's own generations and imported powers from Uzbekistan and Tajikistan. Genetic Algorithm (GA) is used to schedule all units’ output power as well as to find the on/off status of thermal units and the optimal values of the total area occupied by the set of photovoltaic (PV) panels, total swept area by the rotating turbines’ blades and the volume of the upper reservoir of pumped hydro energy storage (PHES) system. The objective of this research is to minimize the total operation cost of thermal units, aggregate imports power tariffs, and the total net present cost of HRES and to maximize the income from selling electricity to Pakistan.